Heather is a nationally recognized Internet marketing speaker, trainer, and consultant in search engine marketing including Pay Per Click (PPC) Search Engine Optimization (SEO) and Social Media Marketing. 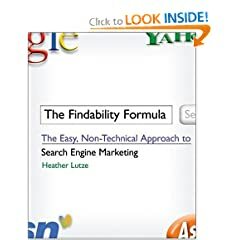 Heather Lutze’s speaking engagements are conducted in the same irreverent style of her book The Findability Formula: The Easy, Non-Technical Approach to Search Engine Marketing (Wiley & Sons) -- delivering equal parts good information and good entertainment to audiences nationwide. Heather is a member of the National Speaker’s Association (NSA), the Colorado chapter of the NSA, and the Meeting Industry Council (MIC ). She is a Certified Google AdWords Professional has a Yahoo! Search Marketing Ambassador Certification, and is a Lead Trainer for the prestigious PPC Summit. She is also a Senior Editor for the Search Engine Marketing Journal (SEMJ) and a monthly columnist for Website Magazine. Heather has been running her own company specializing in search engine marketing for the last 10 years in Denver CO. She has eight employees and is looking forward to growing in the going year. Visit our web site for more information! A testimonial LIVE after hearing Heather Speak!